The discontinuation of CrashPlan for Home on 22 October 2018 is coming soon (see “CrashPlan Discontinues Consumer Backups,” 22 August 2017), so I’ve been receiving questions about how best to restore files from the Internet backup service we now recommend, Backblaze (also a TidBITS sponsor). 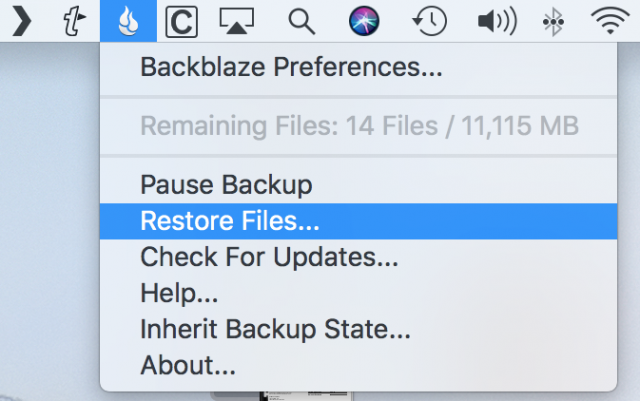 With Backblaze, backups are largely automatic and work seamlessly in the background, but the process of restoring files requires more attention. It’s worth practicing these steps in advance so you can remain calm and work with assurance if you suffer a lost or corrupted file. And there’s no need to wait for Friday the 13th to do it (see “International Verify Your Backups Day,” 13 July 2018). Click the Backblaze button in the menu bar and choose Restore Files. Your default Web browser opens to a Backblaze login page. Enter your credentials and click Sign In. If you have two-factor authentication enabled, enter that code as well, either from your authenticator app or SMS message. If you have a private encryption key, enter that in the field near the bottom of the page, scrolling if necessary to see it. Click Unlock. A file browser appears on the bottom of the page that lets you select files to restore. It will likely take a couple of minutes to load your files, so be patient. At the top of the interface, you can specify the computer and backup from which you wish to restore. 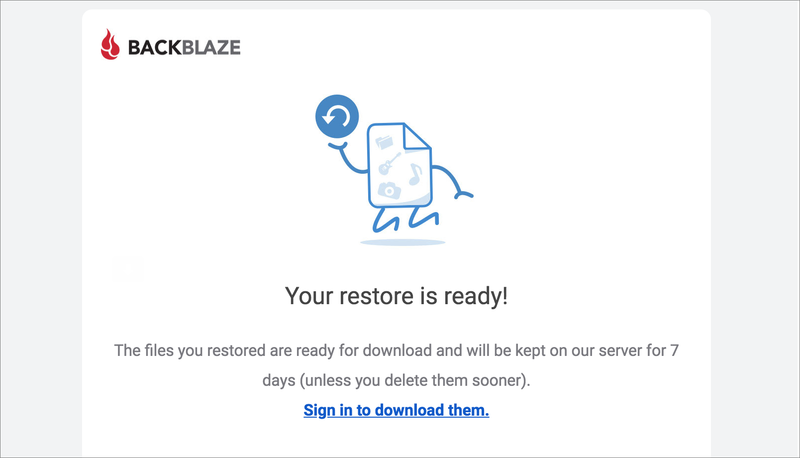 Backblaze retains previous versions of files for up to 30 days, so if you need something other than the latest version of a file that hasn’t been touched in a while, leave Files From pop-up menu set to Beginning of Backup and set the To menu to the date from which you wish to restore. Click Go when you’re done. 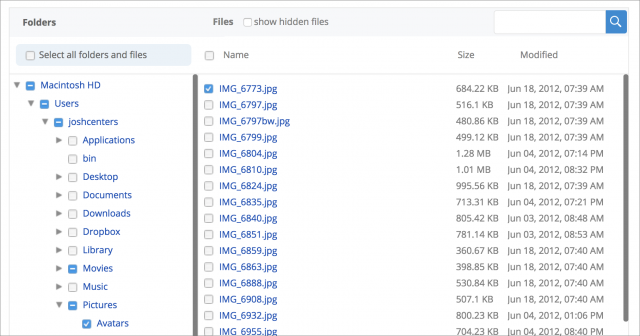 In the file browser itself, you can check Select All Files and Folders if you wish, but unless you have an absurdly fast Internet connection, you’re probably better off having Backblaze send you a USB drive. The file browser is largely self-explanatory. Click the expansion triangles to open folders and drill down to the files you wish to restore. If you click a file’s name, you see options for downloading or sharing it immediately, assuming it’s smaller than 30 MB. Backblaze added this feature in 2017 in response to customer requests. Click Download to download the file in your browser immediately. 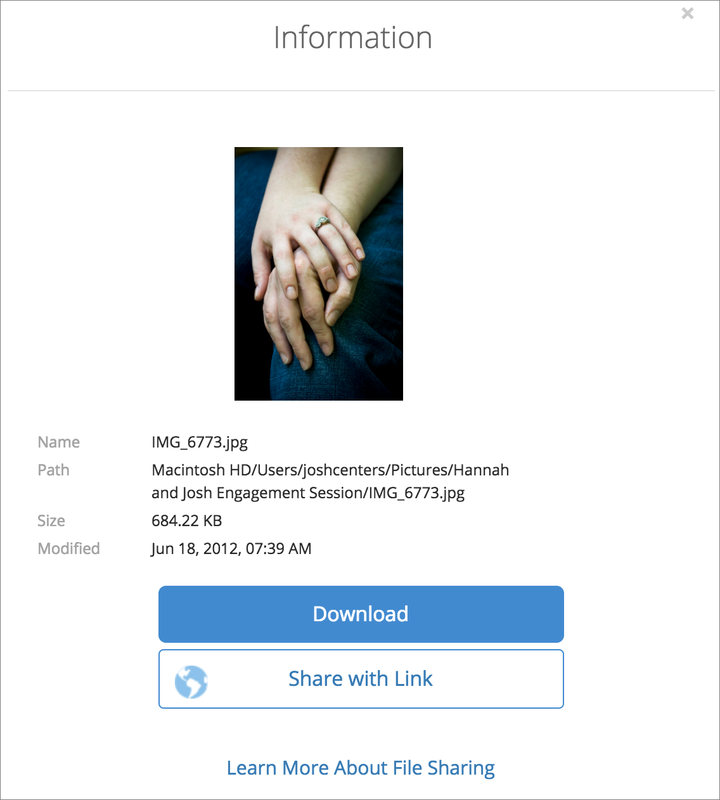 Clicking Share with Link instead exposes a text field containing a URL and a Copy button that copies the URL to your clipboard. Anyone with that link can download the file. See Backblaze’s documentation for some of the trickier details about sharing files in this way, which involves its B2 cloud storage service. If you need to restore an entire folder or more than a handful of files, you’ll have to select the files in the browser and request a Zip file that takes time to prepare. But on the upside, you download all the files you need in one go. In the file browser, indicate the files you want to restore by selecting their checkboxes. If you’re restoring from multiple folders, note how the folders and subfolders highlight in the sidebar, showing where you’ve marked files to download. Once you’ve selected the files you wish to restore, click Continue with Restore. Now it’s time to play the waiting game. Backblaze can take several minutes to assemble your backup archive, depending on how many files you’ve selected, the total size of those files, and the current server load. In my testing, it usually took ten minutes or less, even for a 24 GB restore. Once you’re there, click the Download button to get a Zip archive of the files you selected. In case you find this process of requesting and downloading a Zip file confusing, I’ve made a video that should clarify it. 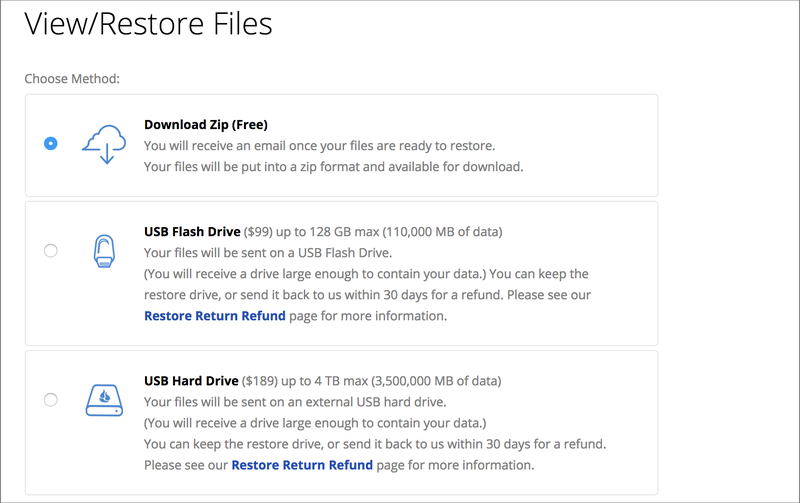 Since you’re getting a Zip archive of the restored files, they won’t be restored to the Finder locations where they came from. Double-click the archive to expand it, and then move the files manually back to their proper locations. To download a particularly large Zip archive, use the Backblaze Downloader app, as it is more efficient and reliable than a Web browser. 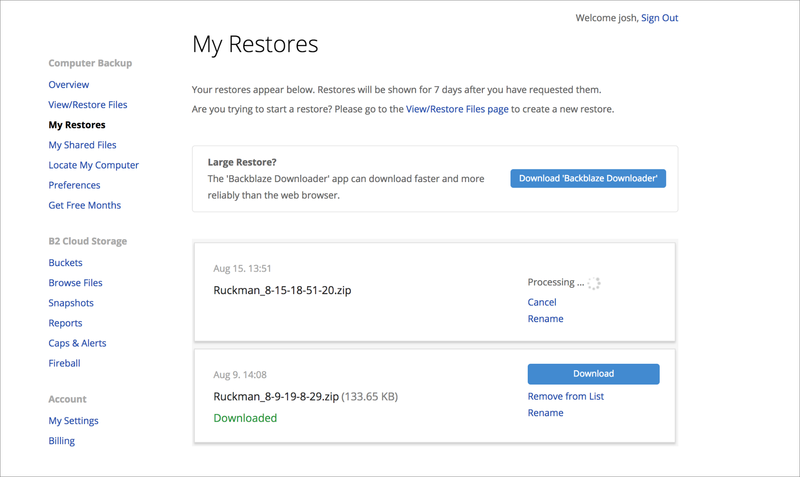 When your restore is ready to download, launch the app, enter your Backblaze credentials, select a local folder to receive the download, click Sign In to Start, select a restore, and click Sign In to Start again. Note that you cannot initiate a restore from the Backblaze Downloader, just download one you’ve already created. I’ve been a paying Backblaze customer for several years now, and although I’m happy with the service, it could use a better restore experience. Ideally, Backblaze would provide a native Mac app for restoring that would eliminate the need for the browser interface, provide the download functionality of the Backblaze Downloader app, and offer the option of restoring files back to the locations from which they were backed up, much like Time Machine. That would eliminate the need to move files back to their original locations after restoring—not a big deal with a file or two, but a tedious task if you need to restore a large number of files and folders from all around your drive. Thankfully, I don’t have to restore from Backblaze very often, and it’s usually just a file or two when I do. But that’s what an Internet backup service is ideal for most of the time—retrieving a small amount of data that has slipped through other levels of your backup strategy. Of course, it’s also essential as a last line of off-site defense should your data disappear due to fire, flood, or theft. You should also be aware of what files & folders are NOT being backed up by Backblaze. If you happen to name an important file using one of the many extensions it’s set to ignore, or put the file in the wrong directory, you’re out of luck. Also since applications and most system files aren’t backed up, you cannot reply on your Backblaze backup alone to restore an entire system. And you better remember all the additional things you installed, or you will be spending a lot of time completing reconstruction after a big disaster. For these reasons I don’t consider Backblaze alone sufficient as the only offsite backup in a “3-2-1 Backup” strategy. 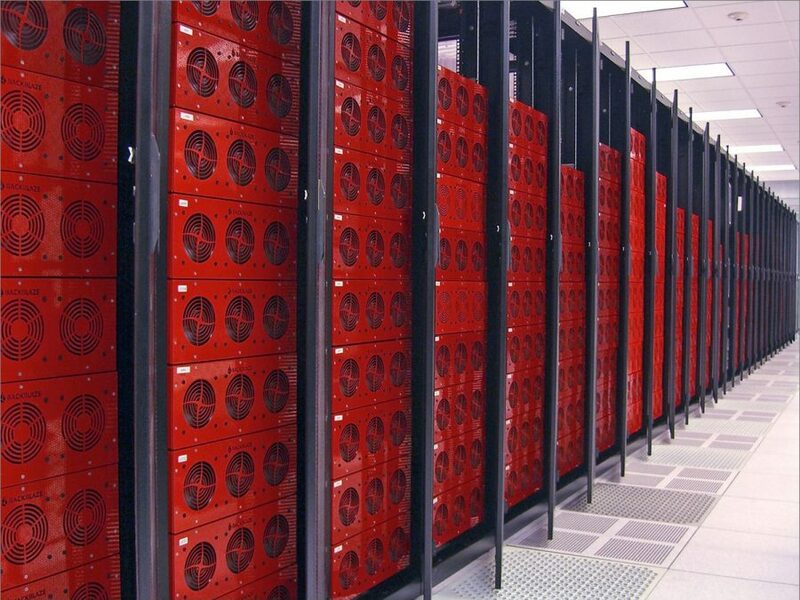 Can you discuss BackBlaze archiving? Is there a way to restore a version of a file that is not the most recent? You should also be aware of what files & folders are NOT being backed up by Backblaze. Yes, and Backblaze is pretty up-front about this. Yes, they’re upfront. But unfortunately many of the default types/folders it skips can’t be removed, even if you’re willing to pay for the storage. It might be useful to explain how to restore from Backblaze B2 as well as from the main Backblaze. We updated the article to explain this more fully. In essence, when you start the file selection process, two pop-up menus let you control which versions appear. Backblaze stores versions from the last 30 days, after which you can get only the most recent version. Thanks for sharing. How long ago did that happen?